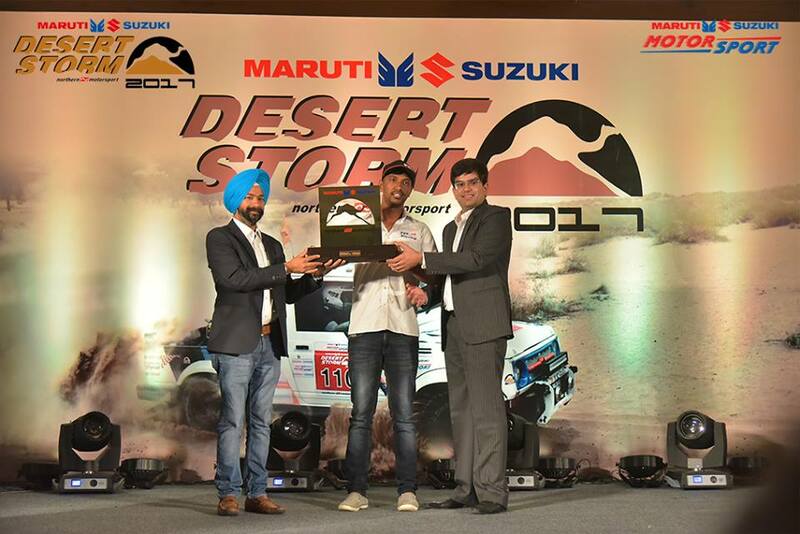 The Maruti Suzuki Desert Storm 2017 concluded on 4th February in Jodhpur. The rally was flagged off from Hanumangarh on 28th January. The journey took the drivers through Bikaner, Jaisalmer and Jodhpur. There were plenty scenarios of drama before the winners were eventually decided. The toughest sections during the rally were: the 198-kilometer-long stretch which was done at a go and the night stage which tested the skills of the drivers to the utmost. 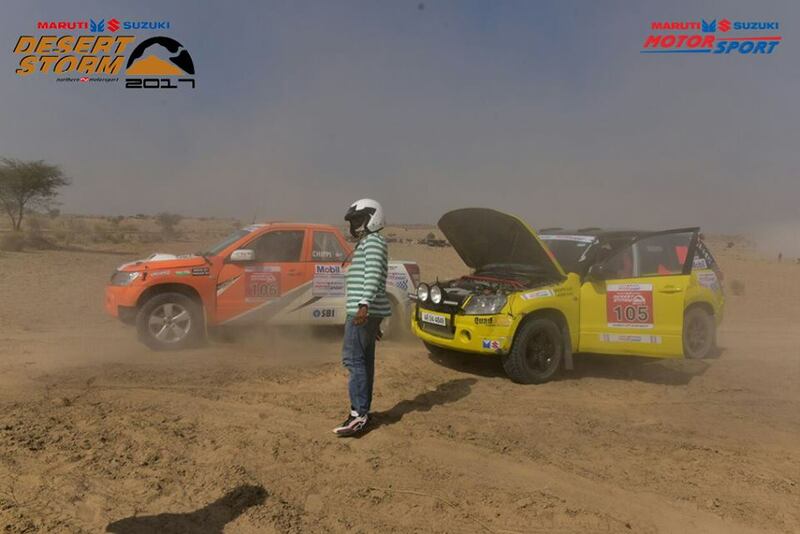 In the Xtreme category Maruti Suzuki’s Suresh Rana and Ashwin Naik (featued in the first picture) successfully defended their title. In spite of getting a 16-minute penalty at stage 2 of #MSDesertStorm2017, they managed to pull through and emerge as winners eventually. They were driving a Maruti Suzuki Grand Vitara this year in the Maruti Suzuki Desert Storm. R Natraj at the Podium! The Moto class witnessed a drama of another kind. CS Santosh of Hero MotoSports was the favorite and defending champion. He displayed a good form throughout the rally. But he too got a 16-minute penalty midway, yet he maintained a narrow 42 second lead. He came ahead of the pack in the end, but he somehow missed the correct finish line and crossed it 30 minutes later after reaching in the vicinity. The winner then was R Nataraj of TVS Racing. Karthick Maruthi and S Sankar Anand at the Podium! The Ndure and Xplore categories are meant to encourage newcomers to the motor sports. In the Ndure category 4X4 vehicles no modifications take part. Xplore is meant for 2 Wheel Drives. But the 2 Wheel drives also had sand dunes for a part of their route. In the Ndure category, Nikunj Toshniwal and co-driver Suvrajit Dutta took away the first spot. Maruti Suzuki VitaraBrezza driven by Karthick Maruthi and S Sankar Anand were the victors in the Xplore category in the 2017 edition. The glittering closing ceremony took place in Jodhpur. Now that the Maruti Suzuki Desert Storm has come to an end, it is time to check out their other rallies. They manage a busy calendar throughout the year in different parts of the country. Maruti Suzuki National Superleague TSD Rally Championship, Maruti Suzuki Autocross championship, Uttarakhand Rally, Deccan Rally, Backwaters Rally, Mughal Rally, Rally of Arunachal and Rally of Himachal are such events to take motorsports to masses. As the names suggest each rally covers a scenic route within the country. 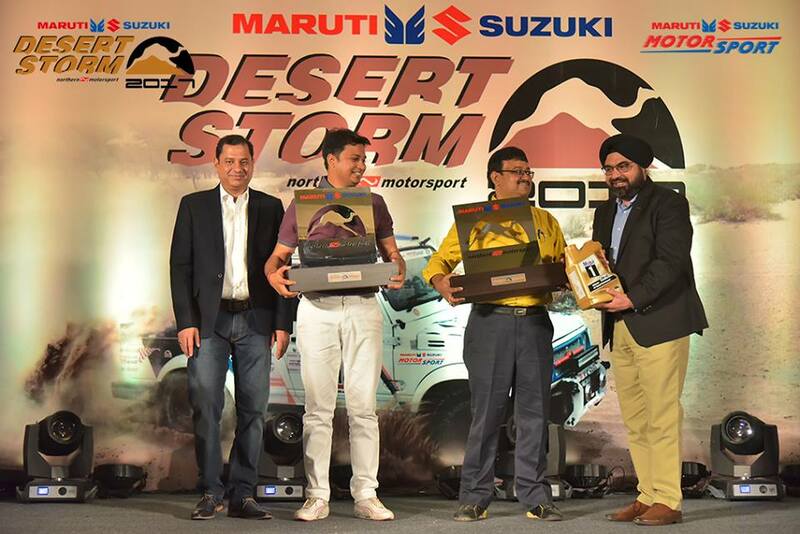 You can see more pictures of the #MSDesertStorm2017 and information about upcoming events from the Maruti Suzuki Motorsport Facebook and Twitter page. The 15th edition of #MSDesertStorm concluded its leg 4 at Jaisalmer with CS Santosh extending his lead by around 10 minutes ahead of R Nataraj. The participants completed a total distance of around 300 KM along the city’s golden Sam dunes crossing Turkon ki Basti, Siambar and Mangaliyawas. Maruti Suzuki Desert Storm is now entering its final phase. The seasoned as well as the budding motorsport lovers, have 4 categories to choose from, viz. XTreme, NDure, Moto and Xplore. And, the presence of veterans such as Suresh Rana, Sandeep Sharma, Bani Yadav and Amanpreet has made this rally even more competitive. 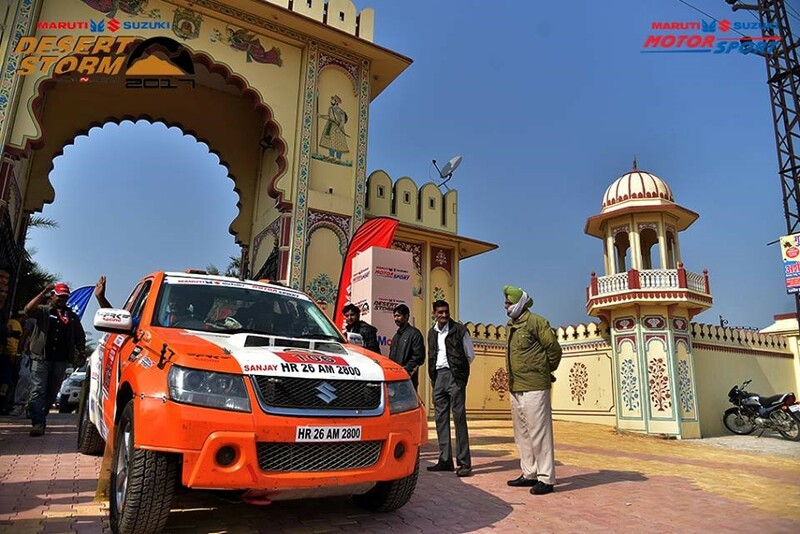 The phase two was flagged off from Lakshmi Niwas Palace in Bikaner and the participants covered a grueling journey of 552 kilometers in 3 competitive stages and reached Jaisalmer. The route taken was Noosar, Kelan, Rajasar, Motigarh and Nokhra to finally arrive at Jaisalmer. The villages are otherwise an oasis of clam, suddenly found themselves in the middle of loud cars and a lot of frenzy. The leaderboard positons at the end of leg2 for the X-Treme category: Sanjay Agarwal along with co-driver Shivprakash E was in the lead, followed by Harpreet Bawa and Virender Kashyap, Suresh Rana and his co-driver Ashwin Naik at the second and third place respectively. In the Ndure category Debajyoti and Arindam Ghosh were seen leading. In X-Treme Moto event, CS Santosh, the only Indian to take part in the Dakar Rally, was in the lead as expected. You can check out the daily positions from the Maruti Suzuki Motorsports page on Facebook or their Twitter feed. In the recently concluded leg 4 in Jaisalmer, CS Santosh of HeroMotosports maintained his lead, he was ahead of his nearest rival R. Natraj (TVS Racing) by 10 minutes in X-Treme Moto category. 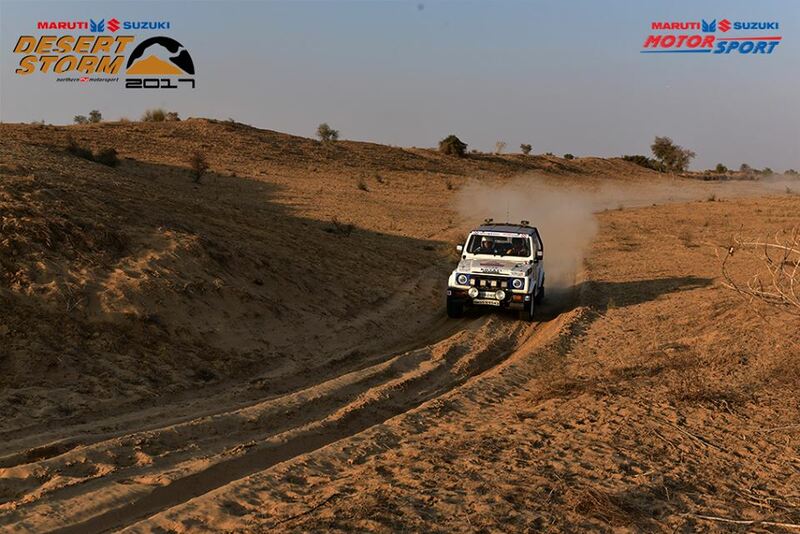 Team Maruti Suzuki’s Suresh Rana and Ashwin Naik were in the lead in Xtreme category! Nikunj Toshniwal and Suvrajit Dutta leaded the Ndure category. There is plenty of action still to come in the final leg which takes the competitors around 500 KM towards Jodhpur for the finish. As the #MSDesertStorm 2017 is moving towards its close, excitement is mounting up. Stay tuned for the final updates on the blog. Motorsport has always challenged the imagination and competitive spirit of mankind since its inception. It pushes the limits of both, the man and the machine, by traversing them through a series of mental and physical barriers. Maruti Suzuki Desert Storm personifies these traits. 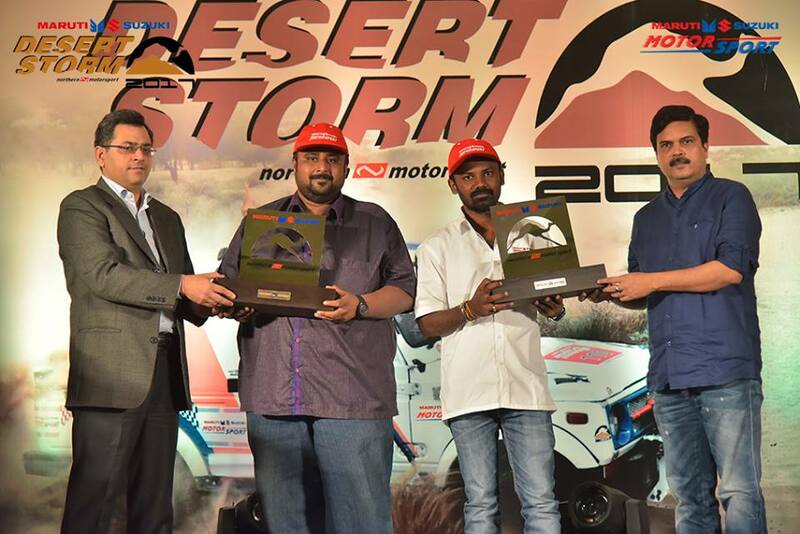 In India, following its belief of making motorsport accessible to its enthusiasts, amateur or professional, Maruti Suzuki has flagged off the 15th edition of its highly successful and exhaustingly difficult rally, #MSDesertStorm–A rally which will witness motorsport fanatics battling their hearts and roaring engines out, in the extreme conditions of Thar Desert for 6 days– from Noida on 29th January. The seasoned as well as the budding motorsport lovers, had 4 categories to choose from, viz. XTreme, NDure, Moto and Xplore. And, the presence of veterans such as Suresh Rana, Sandeep Sharma, Bani Yadav and Amanpreet has made this rally even more competitive. Also, CS Santosh, the only Indian to participate in the Dakar Motorsport Rally, will be in action at the Maruti Suzuki Desert Storm this year to defend his title against 40 bikers. My adrenaline is pumping just by imagining all the action in store for this year’s rally. The route this year comprises of Delhi, Hanumangarh, Bikaner, Jaisalmer and Jodhpur, with an expanse of over 2000km. 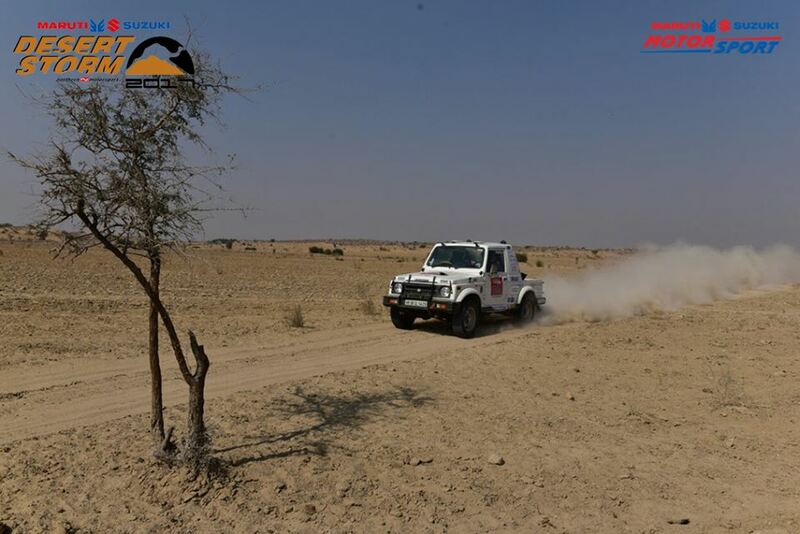 One of the many anticipated phases of the rally will be the 150km night leg around Jaisalmer, where the participants will have the ambient moonlight to accompany their love, and obstacles, for this motorsport rally. Talking about the participants, driving in team Maruti Suzuki colours, Suresh Rana, the winner of various motorsports events in the country and 10 times Raid de Himalaya winner famer, will look to defend his title in the XTreme category. Karthick Maruthi, the winner of the Maruti Suzuki National Super League Championship in 2016 is also participating this year driving a VitaraBrezza. Jagmeet Gill who finished third in the last edition of National Super League is present this year too, once again driving a VitaraBrezza. So the heat of competition will definitely be all ablaze throughout the rally. As you can see, there is an exciting lineup of rally drivers passing through Rajasthan right now and I will be bringing you continuous coverage for #MSDesertStorm on the blog, so stay tuned for more. You can check out the Maruti Suzuki Motorsport Page on Facebook and Twitter. Here is a glimpse to what adrenaline rush looks like.